3 hours and 30 minutes before is normally enough time. The airport recommends you to be there 2 hours early to get through security and to your plane. Boarding usually starts 30 minutes before your plane takes off. However, one hour and thirty minutes is normally enough time. So if the drive from PHX to Sedona takes about 2 hours, then 3 and a half hours before your flight takes off if normally good. With more than 15,000 customers and a few years in business, Airport Shuttle of Phoenix owns Sedona Shuttle, and has drivers all over the State of Arizona. Our main office is 5 minutes from Sky Harbor airport in Phoenix, AZ. 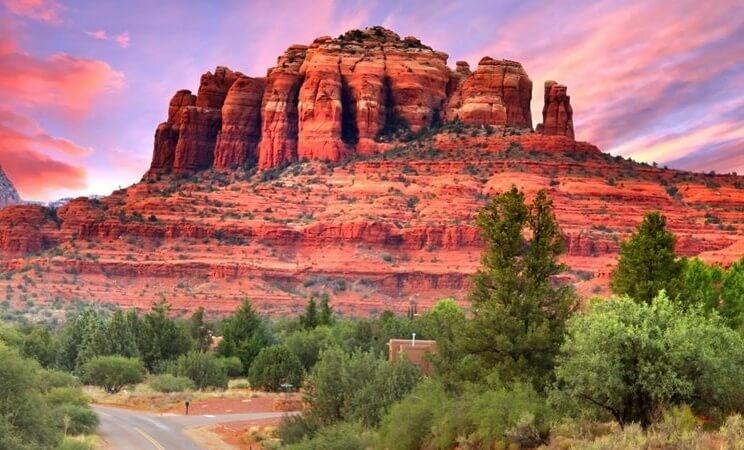 How much does it cost to go from PHX or Sedona? Please enter the full address to get the most accurate rates between PHX and Sedona or vice versa. Book a round trip and you'll get 10% off each way. If it's a one way you can use promo code ONLINE to save 10%. This promo code is only valid on one way trips. If you're booking a round trip you automatically save 10% each way, so you can use discount code NONSTOP instead to get a free upgrade to non-stop. Door to door service is included on all our trips. Usually trips are non-stop in a nicer vehicle. We can pick you up at your home anytime 24/7. We normally take you straight home, which is very different from other companies that leave you at a bus stop and stop and wait at intermediate points for hours. We also don't pack you in with 8-15 people you don't know and stop everywhere. We offer home pickup and drop off service. You can call us 7 pm the day before your travel date or 45 minutes prior if your close by. Does it cost anything to make changes to my existing reservation? The scenic drive from Phoenix to Sedona has a lot of giant cacti and different landscapes. Once you actually get to Sedona, there are massive mountains of beautiful red rock. Even the sidewalks and trails are a beautiful red color. Phoenix to Sedona distance is 119.5 miles or an hour and 40 minutes by car. Things to do on drive from Phoenix to Sedona are take pictures, talk, sleep or read a book. You can also make conference calls or catch up on emails and news. Many people want to go from Phoenix to Sedona to Grand Canyon, because they're both really amazing, beautiful and worth the time. Another destination that's frequently overlooked and amazingly beautiful is Antelope Canyon and Havasu Falls. Phoenix to Sedona shuttle operates 24/7 to and from any address in Arizona. It doesn't have to be the airport. There are many great restaurants between Phoenix and Sedona. One has great BBQ. Another one has great pie. Sedona and Phoenix also have a lot of great restaurants. We recommend Creekside for breakfast and the Mesa Grill at the Sedona Airport for tacos at lunchtime. There is no train from Phoenix to Sedona. You'll need to take a shuttle to Sedona. If you really want to ride the train, we can drive you to Williams, AZ and you can take a train ride on the Grand Canyon Railway into the Grand Canyon National Park. Phoenix to Sedona AZ drive is great if you're not doing the driving. Call us or book online, you'll be happy that you did.